Thyme for Cooking's Main Courses: Shrimp, Pork Chops, Salami Pizza. 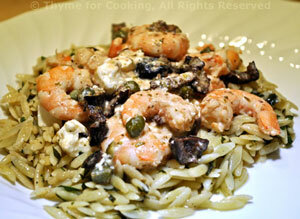 Shrimp with a Mediterranean flavor: capers, lemon, feta, black olives, served on a bed of herbed orzo. Cook orzo in rapidly boiling water according to package directions. Drain. Toss orzo with herbs and 1 tbs olive oil. Pit and roughly chop olives. Cut feta into small cubes. Heat 2 tbs oil in a large skillet. Add shrimp, cook until they curl and turn opaque. Add lemon juice, capers, olives and stir to combine. Remove from heat and stir in feta. To finish: Divide orzo onto two plates. Putting the herbs inside the chicken lets the flavor permeate the whole breast. They're finished with a simple basting sauce and a coating of Parmesan. With a sharp knife make a long slit in the edge of the chicken breast - cutting horizontally and being careful not to cut through the other side. You should have a pocket the shape of the breast with 1/2 inch of 'uncut' chicken around 3 sides. 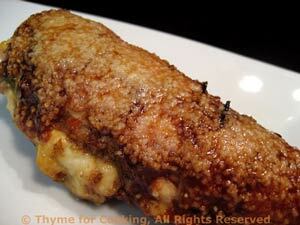 Put half of the sage leaves and half of the cheese in each pocket. Wrap entire breast with kitchen string to hold it together - and keep as much cheese inside as possible. Mix garlic powder, balsamic vinegar and olive oil and brush on both sides of breasts. Grill on barbecue for 5 - 8 minutes per side or until done or bake in oven for 25 minutes at 400F or until done. Remove from heat and remove string. Mix ketchup and soy sauce. Spoon the sauce onto the chicken and sprinkle with Parmesan. Put back on the grill (with the grill turned off) and cover for 2 minutes, just to melt cheese on top. I prefer to use paper-thin sliced tomatoes rather than traditional pizza sauce. If you'd prefer sauce, 8oz (250gr) should cover nicely. We get wonderful salami, but pepperoni, chorizo, or other sliced, spicy sausage would be equally delicious. If you have a mixer with a dough hook put the yeast and all remaining ingredients in mixer bowl. Blend with dough hook attachment until well mixed then kneed for an additional 3 minutes. Cover bowl with cling film or a dish towel and put in a warm place to rise, (75F, 24C) if possible. Put dough in a bowl, cover with cling film or a dish towel and put in a warm place to rise, (75F, 24C) if possible. Roll dough out with a rolling pin as best you can. Then put on pan and stretch it to fit, patting it out with your fingers. If it keeps springing back wait a few minutes. Try not to put any holes in the crust. Finely chop onion, pepper and garlic. Heat olive oil in medium nonstick skillet. Add chili powder and sauté 1 minute. Add onion, pepper, garlic, oregano and sauté until tender. Slice tomatoes as thinly as you can - you should get 5 - 8 slices from each one, depending on how big they are. Tear oregano leaves off the stems if using fresh. On just-finished crust or your purchased crust: Spread onion/pepper mixture evenly over crust. 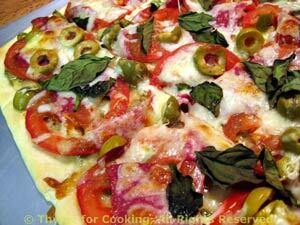 Lay thinly sliced tomatoes evenly over crust - they should be touching and cover the entire crust. Lay salami slices over tomatoes. Bake at 450F (225C) for 15 - 20 minutes, until crust is just starting to color. 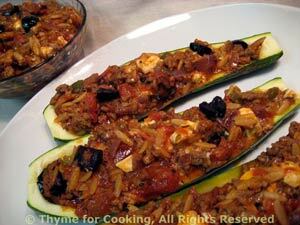 Remove from oven and sprinkle fresh oregano, olives and cheeses evenly over top. 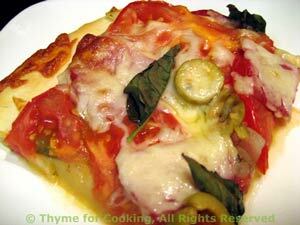 Return to oven and bake an additional 5 - 10 minutes or until crust is brown and cheese bubbling. 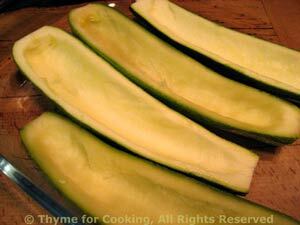 Remove from oven, slice and serve. The woodsy flavor of sage is a classic pairing with pork. Use fresh if you can. Snip sage leaves if using fresh. In a small bowl mix lemon, ketchup, oil, garlic, paprika and sage. Let rest 5 minutes to blend flavors. Spoon on pork chops and let marinate 10 minutes. 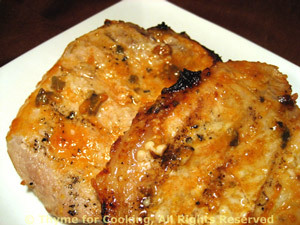 Cook pork on barbecue grill, turning once, 10 - 15 minutes, or until done - take a peak. Note: If not done they can always go back on. A little pink in the middle is okay for pork, (now, it didn't used to be) and the chops will be much more moist if not over-cooked. Or sauté in non-stick skillet about the same amount of time. Capers, tarragon and lemon add a wonderful flavor to chicken breasts. Marinated for just 15 minutes, cooked on the barbecue grill and finished with a lemon, tarragon, caper sauce, these boneless chicken breasts make a lovely gourmet summer dinner, worthy of dinner guests... or just you! Squeeze the lemon and remove any pips. Put lemon juice and oil in a small bowl and whisk well to combine, it should get thick. Put 3 tbs of the lemon/oil mixture into a separate bowl for the sauce. To the remaining marinade add the chopped capers. 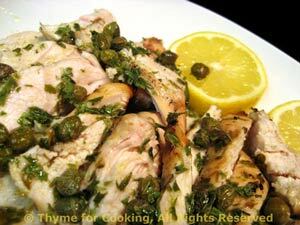 Put chicken in a shallow dish, pour the marinade with the chopped capers over and let marinate for 15 minutes. Snip the tarragon and add it to the sauce (reserved 3 tbs of lemon/oil), set it aside. To cook: Remove the chicken from marinade, discarding the marinade, and cook on barbecue grill for 8 - 12 minutes per side depending on size, or until done, take a peak and see. Or can be sautéed in nonstick skillet over medium heat for the same time. 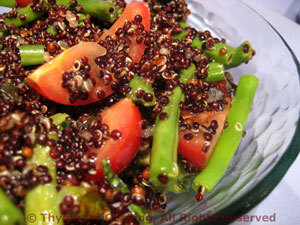 Remove from heat, slice, drizzle the sauce over the top, sprinkle with remaining capers and serve.